Home Page > Blog > Mother and daughter clothes - check out the twin clothing sets: mom and daughter dresses, T-shirts and pants! Mother and daughter clothes - check out the twin clothing sets: mom and daughter dresses, T-shirts and pants! Where did the fashion for mother and daughter clothes come from? Mother and daughter clothes are new fashion phenomena, and it is difficult to refuse their extraordinary charm. Identical sets of clothes designed for both mother and her child, draw the attention of passers-by and make it impossible to take your eyes off such a stylish duo. Where did the idea come from to produce clothing in two size lines - kids and adult ones? It is above all a way out of the stereotype, according to which dressing up like other people is a mindless imitation of their style. It has been assumed that we react negatively seeing a person who, for a given circumstance, chose the same outfit as we did. Of course, the phenomenon mainly concerns women, in men causing rather sympathetic reflexes. Ladies can not imagine a peaceful solution to the situation in which at a party they meet a friend in exactly the same dress. Immediately a simple comparison arises - which of the ladies looks better in the chosen outfit? Who looks more fashionable? And although the rest of the society will probably not pay attention to the situation, the party will experience a worse mood. And even a difficult to rationally explain envy or loudly articulated malice. It is a different matter when it concerns clothes chosen by twins. Parents of identical and other twins often choose identical sets of clothes for their children, wanting to emphasize the unusual similarity between them. It happens that the habit stays with older twins who independently decide on the choice of their outfit. Adult twins - especially if they share one living space - also often choose the same outfits, which is often aimed at highlighting a unique bond between siblings. A new look at the issue of identical sets of clothes is fashion designed especially for mothers and daughters. I am talking about identical sets of dresses, pants, t-shirts or jackets, which look great on an adult woman as well as a little girl, making it difficult to pass by this duo indifferernlty! Mother and Daughter Clothes - let the little one be like their moms! Mother and daughter clothes are the answer to the needs of little girls who, from an early age dream of being like their moms! After all, every woman who has a daughter is familiar with seeing her little girl going through clothes in her wardrobe. The girls try on high heels, apply mommy's scarves or disappear in a hiding spot with a palette of makeup so that after a long moment they will present their mom with a new version of their New Year's Eve makeup styling. For small children, parents are their whole world - omniscient beings, idols each day performing invariably impressive deeds. The first and most important role models that will accompany them for the rest of their lives. Behind imitation of their behavior are also reflexes consisting in a physical resemblance to their mother or father. That's why mother and daughter clothes are an extraordinary distinction for a girl who, putting on an outfit identical to the outfit of her idol, will feel extremely appreciated and treated with the utmost attention. Wearing matching outfits can even be a dream come true for her! 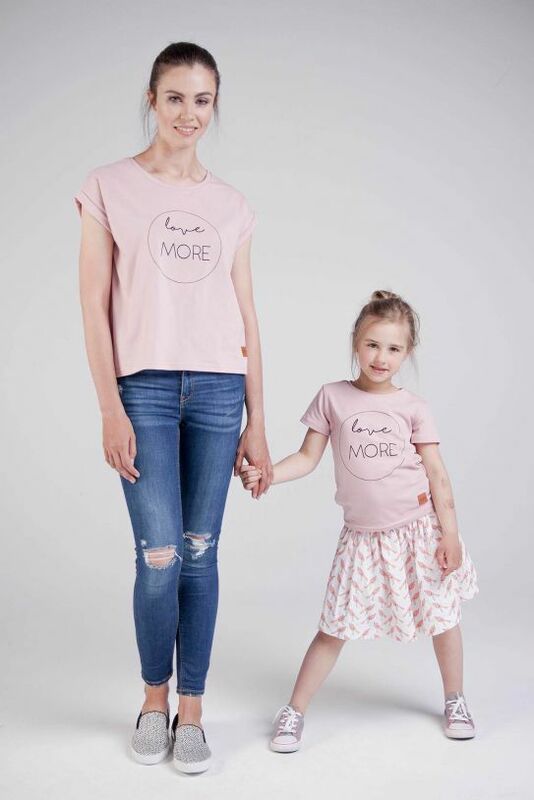 The same clothes will emphasize the extraordinary bond between mother and daughter, unambiguously connecting them with each other in the eyes of both loved ones and strangers. They will emphasize the original style of a woman and paradoxically allow her to stand out at every social gathering or family celebration. How a child benefits from wearing identical mother and daughter clothes? The same clothing for mom and daughter is an idea thanks to which we can teach our child the basics of the sense of style and rules governing the fashion market. Allowing her to wear outfits that look like a small version of her mom's clothes, we give her a clear sign that she was grown up enough to learn the rules governing adult fashion. From childhood, she will take care of the clothes she's wearing, wear them consciously and with confidence assured by the invigorating company of her identically dressed mommy. Wearing identical clothing is also an extremely binding experience. For this reason, do not abuse the opportunity to dress in the same clothes, so that the uniqueness of such an event does not lose its magic. We can put on the same sets for a bigger shopping trip - it is easier for the child to identify the place where the mother is, and if the daughter disappears for a moment from the sight of her parents at a shopping mall, other buyers will immediately notice their unmistakable similarity. What should you watch out for when choosing the same clothes for you and your daughter? the comfort of wearing - although it seems obvious, all the clothes you buy (and especially those for children) must be really comfortable to wear. Even the most beautiful dress will not please the little princess when the straps will be uncomfortable and the fabric of the outfit will irritate the delicate skin of the girl. When choosing a wardrobe for a mother and daughter, pay attention to the outfits being soft, comfortable and not blocking movements of the elemental child. In the end, we look the most beautiful in what we feel best in. If you are looking for mother and daughter clothes that fully meet the requirements above, be sure to check out the assortment of out Mamatu online store! In addition to a large collection of clothes for children of all ages and a line of clothing for nursing mothers, there is also an impressive collection of clothes created especially for mothers and daughters! Same dresses, pants or T-shirts? No problem! And only on the basis of certified raw Polish fabrics. Mamatu is a guarantee of quality that lasts for years, extraordinary comfort of wearing and a unique, unique style. Familiarize yourself with mother and daughter clothes from our collections - more products are presented below. Mother and daughter dresses - explore the power of the same clothes! The same dresses for mom and daughter are an absolute must-have in the wardrobe of all princesses! Regardless of whether it is an outfit for important family celebrations such as weddings, baptisms, and communions, or a comfortable dress perfect for a family walk or visit with grandparents, both the mother and her daughter will certainly feel special. The offer of the Mamatu online store includes many different dresses created both for young mothers and their daughters. You can choose from dresses suitable for formal circumstances, suitable for larger celebrations and dresses made with a pinch of salt, such as a cheerful dress with a flamingo pattern. Are you looking for the same sweatshirt dress for mom and daughter? Check out the Mamatu store offers! One of the most interesting proposals for mother and daughter dresses in the assortment of the Mamatu online store is a sweatshirt dress in a shade of dark powder pink with a modern design representing flamingos. This is a comfortable cotton dress that looks great on both a fashionable mother and a little princess! The dress has a loose, slightly globed bottom, making it perfectly suited as a comfortable outfit for a walk or family shopping. The composition of both copies contains 95% cotton and 5% elastane, thanks to which the clothes are pleasant to the touch, light and breathable. At the same time, thanks to the loose shape, it works well on various types of figures, masking imperfections if necessary. The fabric from which the flamingo dresses were made does not wipe, does not deform after washing and does not pill - all thanks to the use of the best quality regional knitwear. The version designed for a few years old has the additional advantage - it can be treated as both a dress and a loose tunic to wear with tights or kids leggings. The garment does not block child's movements, thus ensuring comfort of unrestricted plays. Each of Mamatu's clothes is hand-cut by Polish dressmakers, thanks to which it gains a unique and original character. Similarly, in the case of flamingo sweatshirt dresses - for this reason, their dimensions may vary slightly depending on the copy. We have good news for nursing mothers - the flamingo dress is also available in a breastfeeding version! Do you want to please your child? Find interesting t-shirts and other mom and daughter clothes! T-shirts and other mother and daughter clothes are a way to beautifully emphasize the bond between a woman and her child. It is also a way to play with fashion and an ease in expressing yourself for the mum and an unforgettable experience and distinction for a little girl. In the Mamatu store's offer, you can find several proposals for the same t-shirts for a bigger and a smaller girl. The T-shirt with a HELLO SUMMER imprint, available in two shades of colors - gray and white, perfect for those eagerly awaiting summer. A simple inscription on a transparent background captivates with its form, especially if it can be admired in both mom's and daughter's styles. HELLO SUMMER T-shirts are made of the best quality knitwear certified by Oeko-Tex Standard 100 textiles, one of the most important certificates in the clothing industry, granted only to products made with consideration of the ecological production process. Knitted fabrics with this certificate also guarantee 100% safety for our health, are hypoallergenic and are great for the production of children's clothing. Mamatu also offers twin t-shirts with the enchanting love MORE phrase in the shade of snow white and pleasant, powder pink, perfect for delicate, girly stylizations. If you want to preserve the great look of Mamatu clothes for a longer time, remember that all products should be washed and ironed inside out. This will ensure long life for both the fabric itself and the print on its front. To emphasize the twin vibe of the t-shirts, it is worth reaching for other offers of mother and daughter clothes. As a complement to the set of HELLO SUMMER and love MORE T-shirts, a tulle skirt in a shade of graphite gray will be perfect. With this combination, both mother and daughter will look gently, girly and fresh. Similar sandals will be suitable for the stylization, and on cooler days - sneakers and thicker tights. T-shirts and soft sweatpants look great on T-shirts, which can also be found in a small and large female version in the Mamatu store! An interesting range of twin clothes for moms and daughters can also be found in the department of Mamatu sweatpants. The store offers a fashionable collection perfect for mothers who like comfortable, non-binding movements sweatpants, which are perfect for walking, fulfilling home duties or as a family trip to the movies. They can also turn out to be irreplaceable as a sports outfit - for a morning jog or a visit to a fitness center. black trousers with imprints of white, geometric bears. All pants - both for the little princess and her mommy, were designed in a version with comfortable pockets and soft, comfortable waistbands. Each piece is made of a soft, pleasant to the touch sweatshirt fabric with a dense weight of 270 g / m2, which means that the pants are warm, but they will not make you too hot. All imprints were created using eco-friendly paint, thanks to which the pants are fully safe for children's delicate skin. Remember that to keep their vivid colors and well-shaped cut for as long as possible, you should wash and iron the pants only inside out. Due to the fact that each copy is cut by hand by talented Polish dressmakers, individual items may differ slightly.